Quinton Coples will be watching and learning a little more than you might expect from a top draft pick if he doesn't improve his technique quickly. Photo by Jene Bramel. Editor’s Note: Dr. Jene Bramel is a staff writer at Footballguys.com where he is among the best in the fantasy football business analyzing individual defensive players and player injuries. His top-notch work includes the columns “Reading the Defense,” “Second Opinion,” and his popular segments on The Audible podcasts. You can find the first part of his analysis of Quinton Coples’ performance against the run in this earlier post. Follow Jene on Twitter @JeneBramel. Many observers – myself included – have compared Quinton Coples to Julius Peppers. It’s hard to avoid the comparison. Both are tall, athletic all-around defensive end talents from North Carolina capable of dominant play. Yet when asked which current NFL player he feels his game most resembles it isn’t Peppers that Coples mentions. It’s Jason Pierre-Paul. I think Coples’ comparison is reasonable. 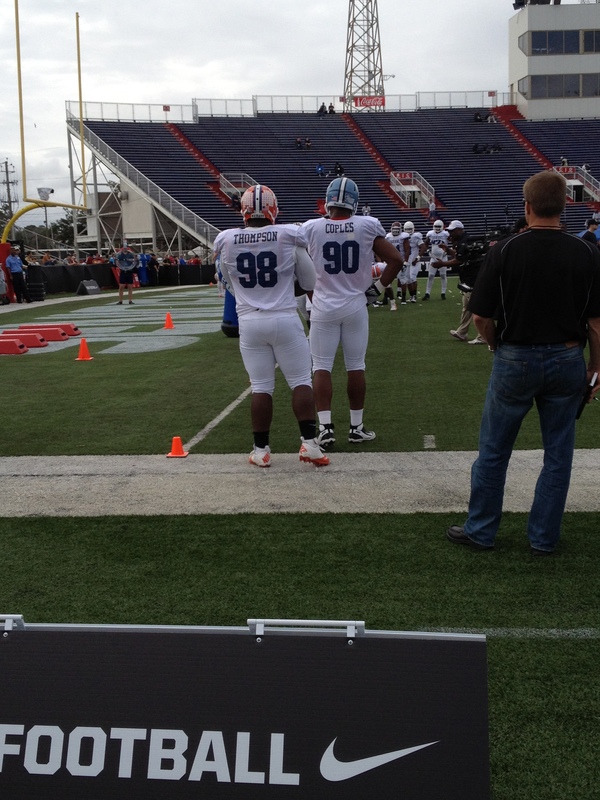 Both players have long arms and strong hands and consistently good inside pass rush moves. Coples featured a devastating swim move at the Senior Bowl that could have been a mirror image of Pierre-Paul’s best efforts. But Coples still has work to do to reach Pierre-Paul’s level as an all-around pass rusher. To do that he’ll need to develop an effective edge rush move. And s I noted in yesterday’s post, he’ll need to improve his pad level and technique. Only then will Coples be able to add to his repertoire. Let’s look at two plays from the Independence Bowl that show the good and bad of many Coples’ current edge rushing efforts. I’ll then compare and contrast Coples’ technique with Pierre-Paul – the player in whose footsteps he hopes to follow into NFL stardom. Let’s begin our look at Coples’ technique with a screen capture of his stance. As noted in yesterday's post with Coples on run plays, it all begins with the stance. Coples gets into a coiled, balanced stance on the balls of his feet. He is now in a position to drive off the line at the snap and get into his pass rushing move before the offensive lineman can get into his pass blocking set. This photo provides a dramatic example of what a technically sound stance combined with elite athleticism can do for a pass rusher. Coples explodes off the line and into his pass rush move before anyone else on his defensive line can get their hand off the ground. 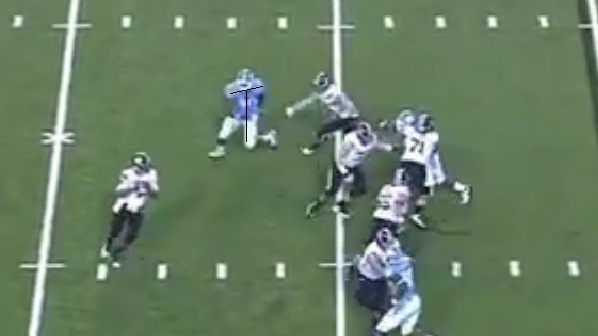 He’s already nearly even with the offensive tackle and he’s off the ball at a great angle. This play should be over before it can get started, but what Coples gives back the advantage just as fast as he took it away. The problem with elite athletes that lack great fundamentals is that they can give away an advantage just as fast as they initially earn it. The angle lines show his body stature getting high. A no-no for a pass rusher. Instead of maintaining his pad level, dropping his inside shoulder, and driving at an angle toward the pocket – what pass rushers refer to as a good “lean” – Coples body stature gets high. 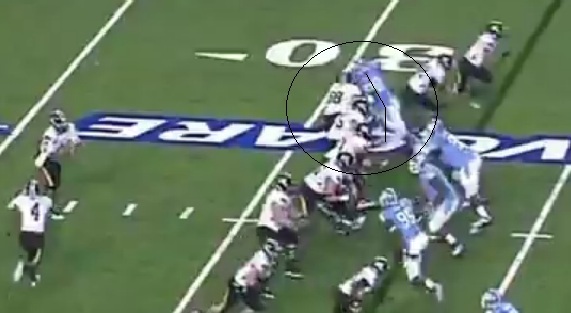 Coples also turns his shoulders away from the pocket. These two mistakes give the offensive tackle a big target and the right angle of momentum to recover and redirect Coples. Coples continues to compound the situation as he continues to raise his body to meet the contact of his opponent. The higher Coples pad level gets, the worse his situation becomes. Now almost past vertical, Coples has made no progress toward the pocket and is further from the pocket and closer to the numbers than he was when he initially beat the offensive tackle off the snap by more a step. It’s like he dug a hole in record time to push his opponent, handed the guy the shovel, and instead threw himself in! This image embodies the dichotomy of Coples’ athletic prowess and his technical weakness. Coples is explosive enough to find himself seven yards upfield and two full yards behind the spot at which the ghosted (play fake of a) jet sweep takes took place. Unfortunately, he’s a non-factor because of his poor technique. 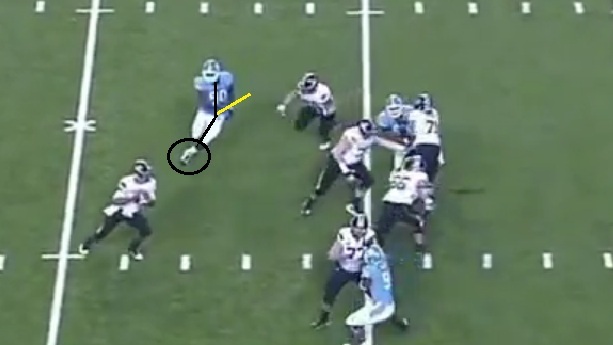 This play ends with Coples on the ground – resorting to a baseball slide to stop his momentum. Better pad level and lean probably results in Coples knocking the wide receiver (No.4) and the quarterback down like dominoes. The play above isn’t an isolated example of Coples’ issues. 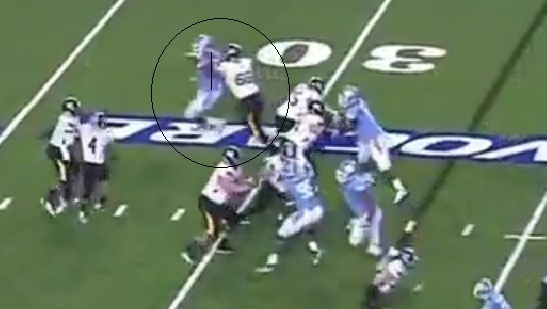 A few snaps later, Coples collapses the pocket and would have been awarded a quarterback pressure by most statisticians. Instead, he likely left on the field a game-changing, blind side sack. Deja vu? Coples exploding from his stance and cleanly beating an offensive linemen at the snap. Will there be a somewhat familiar tragic ending? See below. 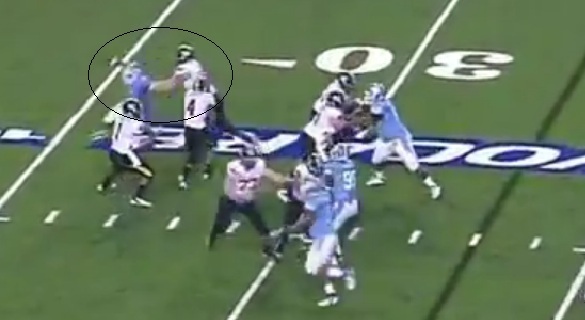 Again, Coples initially whips past the offensive lineman. This time the defensive end’s helmet is behind the offensive lineman’s helmet as he finishes his second step. His pad angle and direction are also better. 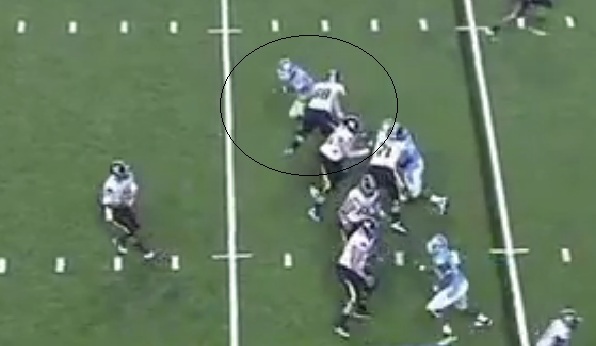 Although Coples doesn't allow his opponent back into the play, he takes himself out of it. Instead of dropping his shoulder, planting his outside foot, and giving himself the angle to get into a proper lean, Coples raises his upper body and loses his good pad level. 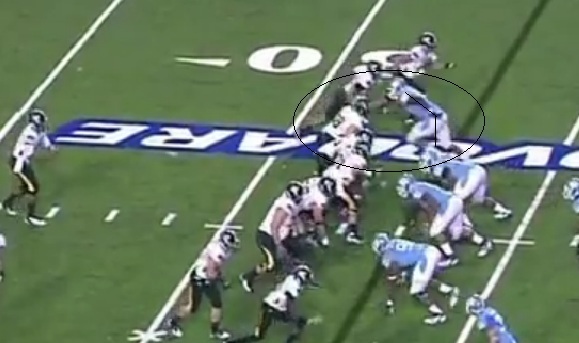 His momentum is again taking him on a vertical path, and this time the offensive lineman has little to do with it. What do a technically sound DE and a technically sound RB have in common? Knowing which foot to use when executing a cut. A good running back knows that planting on his inside foot is a recipe for disaster. Coples next step nearly trips him up as he tries to regain a good pass rush angle. It’s a testament to Coples’ athleticism that he can make this cut at close to full speed at this angle shown by the black line. Had he used a proper body angle (yellow line) and pad line two yards sooner at the level of the offensive lineman, Coples is very likely already on the quarterback and impacting the play. At this angle, the Missouri QB has little difficulty making a single hitch step up in the pocket and completing his pass. Coples clearly has the athleticism to become a dominant edge rusher. His explosiveness off the ball and hand strength gives him the ability to put himself in a position to win the edge. His coiled stance shows he can get low enough to turn the corner. If he makes the necessary adjustment in his technique, he can be every bit as effective as Jason Pierre-Paul. Next from Jene Bramel: Bramel profiles plays from Jason Pierre-Paul that show what happens when a defensive end combines good technique and pad level with elite athleticism.